Indore-based automotive artist Vidita Singh draws paintings of vintage cars. You get it when guys go mad about cars, no matter whether they are driving them or just talking about them. To an extent, some girls do that too. But you could never imagine a girl painting cars with passion. Meet Vidita Singh, who is the first and possibly the only successful female automotive artist in India, famous for her art on classic cars. Singh, wanting to preserve India’s automotive history and tradition, turned to canvas to bring the classic machines to life. Belonging to the royal family of Barwani, an erstwhile princely state in Madhya Pradesh, Singh was exposed to fine automobiles and the stories attached to them from an early age, which became the reason for her becoming one of the first automotive artists in India. She is based in Indore. “The passion for automobiles has been passed down for generations in my family. It started with my great grandfather, and it is an honour to continue the legacy. He was the Maharaja of Barwani and an early adopter of the automobile. My father Manvendra Singh is a recognised figure in the Indian automobile industry. A pioneer in the field of automotive restoration and a keen historian, he co-authored The Automobiles of the Maharajas,” the 36-year-old artist says. Automotive art itself is a rare profession. So how did Singh get hooked? Being always fond of art, she started painting seriously only after school. A master’s degree in Art History further enhanced her artistic drive. “I was commissioned to illustrate one of my father’s articles on an old racing Fiat Corsa, after which I decided to become an automotive artist. The journey so far has been slow and steady. I have had solo exhibitions in Delhi and Mumbai this year,” says Singh, who is preparing for an art exhibition in Dubai scheduled later this year. She was commissioned to make a painting for Ford Motor’s centenary celebrations, which now hangs in the office of the company’s India managing director. Singh has also made paintings for the corporate office of Hyundai Motor Company, India. While our country is yet to catch up with the world in automotive art, Singh believes that is because the art form is not considered as mainstream. In her words, the beauty of automobiles of the past is the reason for her becoming an artist. She sees cars, especially classic and vintage, as masterpieces of design. Through her paintings, she wants to try and bring their beauty to the forefront. She believes that if we can consider ‘Still Life’ as a category of fine arts, then we can definitely see the beauty in the lines of a vintage or classic cars. 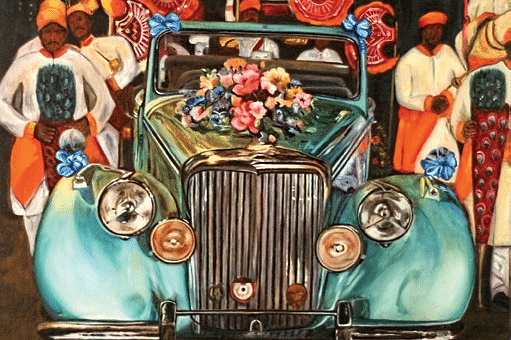 For Singh, cars have soul and she tries to bring out their stories in her paintings. Her works include a wide range of sceneries, and canvasses such as oils, charcoals and watercolours. She wanted to bring out the beauty of the country and the cars as they would have been in their days of glory and thus started documenting historical aspects of Indian motor history. 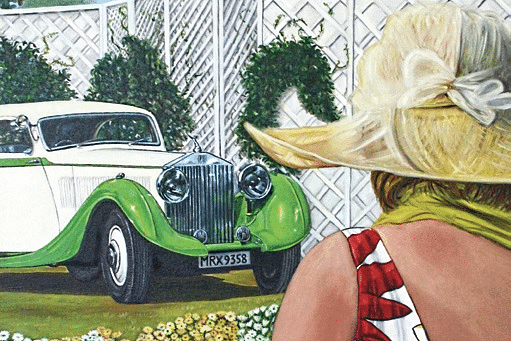 Her depictions comprise the classic cars parked in palaces, driving up a dusty road or going up the Himalayas. Of all the paintings that she has sold, ‘Buick at the Shikaar’ and ‘Lancia at the Polo Match’ are her favourite ones, as they truly represent the essence of her vision. Singh wants to present her art as a tribute to the work done by her family and that is the desire that keeps driving her forward, to paint every car which represents Indian automotive history and bring out the beauty and character in each of them. Singh wants the automotive art to catch the attention of many more in India and hopes if manufacturers can give an impetus to it, the art form will definitely go several miles.